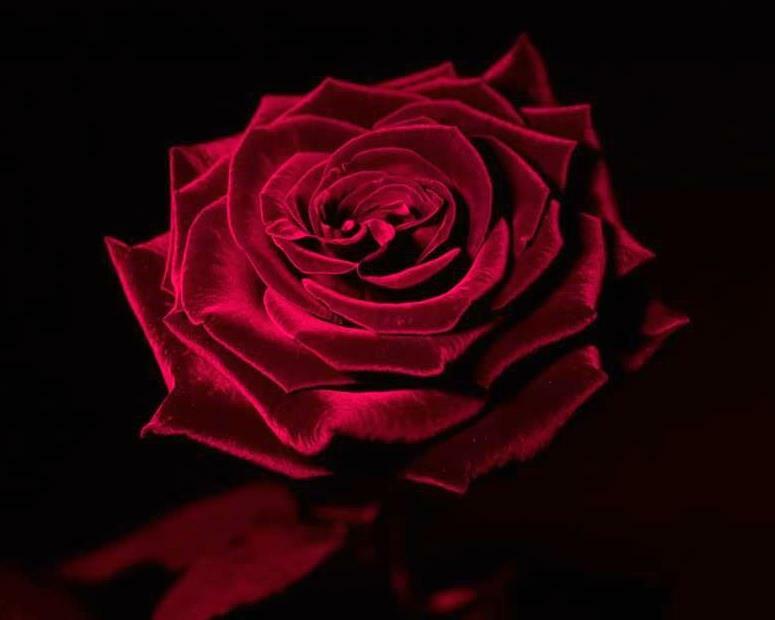 Yes, this is a red russian rose, and it is not shot in visible light. Klaus, if I may, what were your goals in this shot? that even a tiny insect may be able to see something we will never be able to see with our limited senses. This is a shot using ultraviolet light only and a soft focus lens. I like the idea but I think it lacks something you were trying to capture. I wish I could pinpoint what that was but it eludes me. I noticed in my exhibits that some have an issue with that "unnatural"
color of that rose. This "it can't be" hinders sometimes viewers to enjoy. shows the velvety structure of the petals. I don't think so. I'm not sure what it is, but it doesn't stand out. It's pretty but lacks the wow factor. Shakespeare considered a rose would be the same no matter what! 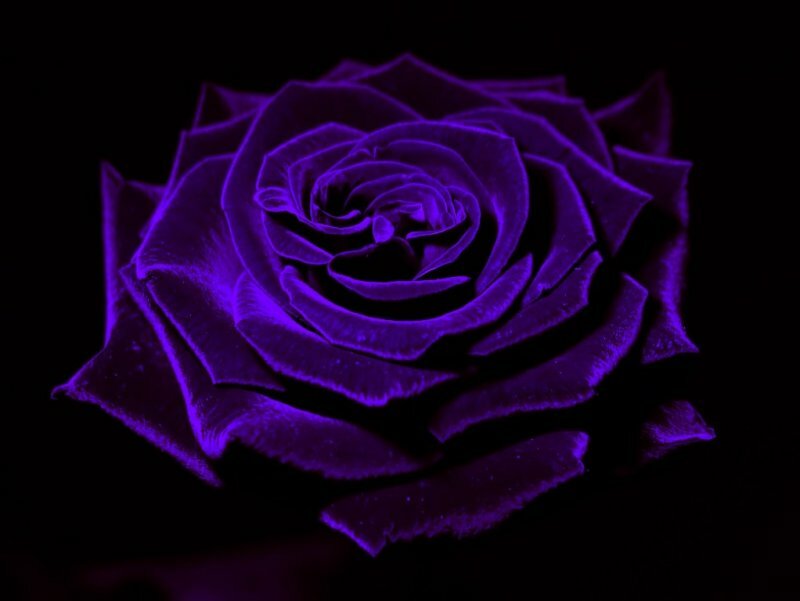 For us too, the Rose is the sum gestalt all the wonderful roses we've experienced: the red ones that lovers give, the ones on funeral caskets, the white one's in the jacket of a dandy, a garland, all and more make up our ideas of a rose. Your rose is not anything Shakespeare would have considered. It's observed differently in a parallel universe. We could call it Heaven Night Flower for it really seems to be part of a night sky. This is no rose you have even sniffed! This is the giant dark magenta state of being that insects inhabit. We do not sniff as the insects do. We do not have compound eyes as they do. Each petal to them is a giant mass to explore. What we do see is certainly divorced from the usual assumptions we have. Even William Shakespeare would not recognize this as a rose but rather something from some herb garden of a witch from a cave in the bowels of the earth. So what you are missing is everything! That's the idea, I think of looking at things in new ways. It's this which allows us, from time to time to obtain insights otherwise closed to us. Oh I agree it's pretty. Oh Rachel, I just knew you'd come around! After all, who can resist Romeo's Orphelia? Thanks for these nice words. Yes, "a rose is a rose is a rose" in this or parallel universes. From that same series and color adjusted to match the original color (don't forget that it is a monochromatic shot as UV has no "color"). Beautiful, but does that velvet appearance come through with visble light? Not to that extent. UV light is about 1.6x shorter in wavelength, so this is also the increase factor in resolution (roughly) - the reason why the chipmaking industry started with lenses for green light (546nm) and now over the decades works with excimer lasers and special quartz fluorite lenses for deep UV "light" up to 193nm (factor 2.8x compared to green light).